Westminster: The very essence of the traditional English mixture; rich, elegant, refined, and exquisitely balanced. New World red Virginias are enhanced with a gentle caress of bright leaf, then lavishly seasoned with rich oriental tobaccos and generous measures of noble Cyprus mountain Latakia. Westminster is a satisfying blend, presenting layers of flavor to delight the senses and develop in the bowl. A perfect everyday English mixture. Full-bodied. G.L. Pease Westminster is one of those rare blends that come along that have your jaw dropping and your mouth watering from the first bowl on. This blend is nothing short of being bloody brilliant. With the new year just getting off to a start I now can say, "bring it on!" The red virginias will have your mouth watering and will proceed to be soaked up nicely by the rich Cyprus mountain Latakia. This smoke leaves you in the tranquil and peaceful zone. This stuff is consistently yummy down to the bare bottom of the bowl leaving white ash. For those of you who do not smoke a bowl back to back...that will all change here! 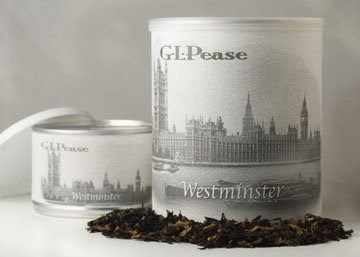 With a market full of just okay blends we thank you Mr. Pease for standing out with Westminster. Brilliant! Brilliant! Brilliant!